Winning one crown is great; twice may be coincidence; three times is undoubtedly a habit. But nine times? Whatever you do nine times is fixed in your psyche, is part of your DNA, is running through your blood. 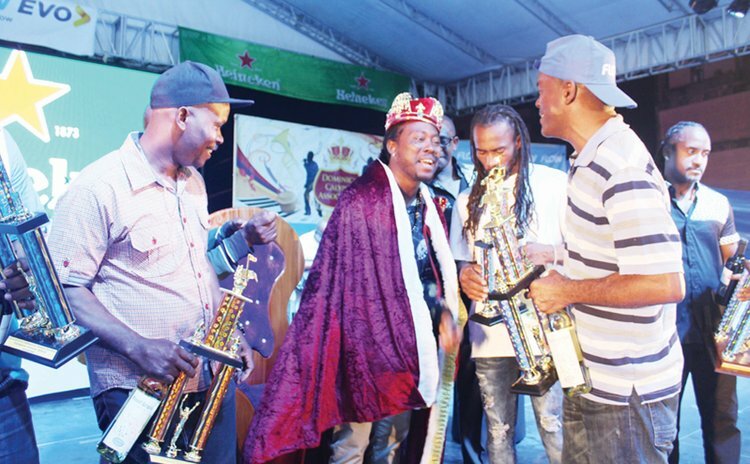 That's the only way to explain the enigma that is Dennison "Dice" Joseph who indelibly inscribed his name in the history of Caribbean Calypso when he won the Calypso King crown for the ninth time, at the Windsor Park Stadium forecourt last Sunday morning. Thus Dice dethroned De Bobb, the 2018 monarch who surprisingly came in first place with his renditions: "Who Dey Love Dey Love" in round one and "Born in Dominica, Let Her Free." A favorite of the crowd, Dice who sang at number three of a lineup of ten calypsonians, opened with "Gran-mama…We Have to Fight". Dressed in a military outfit, Dice brought four graves on stage and had one labeled "RIP Gran=mama" and went on to place a rose on her tombstone. "Gran-mama you remember your political struggles from the Seventies when Uncle Phillip Timothy died for our liberty," Dice sang. "His blood was shed in vain cause look today we facing the worst dictator again. "The hero from your struggle has joined the oppressor; and they are wickeder than before." And despite the intermittent showers, Calypso lovers did not move; Dice had them dancing and swaying with his popular number "Jumbie Money" in round two. When the results were announced six hours after the show began, Webster "Webb" Marie, who was also a favourite with "Darkness of Blackness" and "Overnight Labourite" was adjudged 4th, with Tasha "Tasha P" Peltier, the only female in the calypso Finals with "Put Your House in Order" and "Ross Responds". Speaking to reporters shortly after his crowning Dice said he was not concerned about being crowned nine times but more about coming on staging and delivering and executing properly and achieving something from it. "But now that I have made it nine times…it feels nice," he said "I went in that competition on a mission and Calypso is the only genre of music that speaks about governmental things and that of the nation," he said "The people must have a voice. It must have politicians but it is the people who will say if I put this guy in my shop and he not running it properly, then you take him out and put someone else because the shop belongs to you, the people," Dice said. He said he was comfortable with the topics which "suited him." The topics were nice. My material was on me early. People say that Pat (Aaron) gives me what he wants. No,I have my own mind and I chose; if the topic is good I will stick to you, if not I will decide," he said. "Sing for the people, you can't sing for a select few."